Advancing FCS is my passion and my responsibility as Director of Advancement at FCS. My primary work at school is to raise funds to give us the means to accomplish as many of our educational and community goals as possible each year. I love my job, and I am excited about each new school year, with its energy, its challenges, and its opportunities. Let the mystery unfold! Earlier this week, I happened upon a group of students eating lunch and informally discussing different kinds of families. I was struck by how respectful the children were of each other. Listening to the news on the way home underscored how much adults in our society could learn from a day at FCS! When our building was just an idea, Stephanie Natoli was a student at the old site of FCS. She and her classmates walked this wetland property to envision how a new building would be sited. With a shovel and a hardhat, she was one of the students who broke ground for the building’s construction. And her class was the first to graduate from these halls. Friendship is a beautiful thing! In April FCS hosted over 175 grandfriends of FCS students for musical performances, visits in the classrooms, and a luncheon served by the 5th graders. Sowing seeds of thanks! Third and fourth graders harvested seeds from the native plants in the FCS Butterfly Garden and packaged them as “thank yous” for contributions to the 2016 Annual Giving Fund. Rights not Fights! 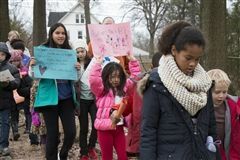 Chanting and singing, the entire FCS community marched last Friday to a local park to commemorate MLK,Jr's birthday and the 1963 Children's March. The new tables and benches are a hit! Great for hanging out, tying a shoe, chatting before carline... How did we live without them? Thanks to Jason Dechambeau and Eric Rosenthal for their leadership, and to everyone who lent a few hours and a lot of muscle last Sunday to get the benches and tables built and installed in one afternoon! 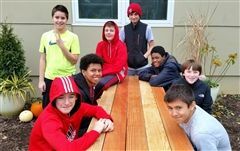 This project was funded through a collaboration among the Parents Association, an anonymous donor, and the Annual Giving Fund. There’s a lot you can do with the song “Happy Birthday.” Just ask the students at Friends Community School after today’s workshop with the DaPonte String Quartet of Damariscotta, Maine. What is perched on Friends Community School’s roof? It’s a “WeatherBug” that records real-time data and images of the weather for the National Weather Service, NBC-4 News, and STEM studies at FCS. 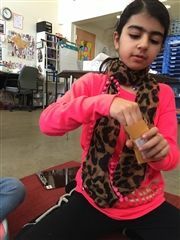 When Nepali friends were caught in the first earthquake last month, Sophie, an FCS 5th grader, was moved to take action. She launched a fundraising campaign to benefit earthquake victims in Pokara. Lee Hilling, author of the new book A Place of Miracles and great-grandfather of a student at Friends Community School, visited FCS's 6th grade to share stories of establishing a critical care surgical hospital for children in war-torn Afghanistan. Setting a new record for a 29-year tradition at FCS, more than 150 Grandfriends visited the school on Friday. 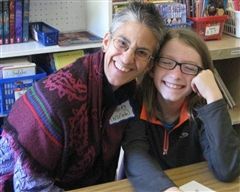 They participated in classes and reflected on their own childhood educational experiences. 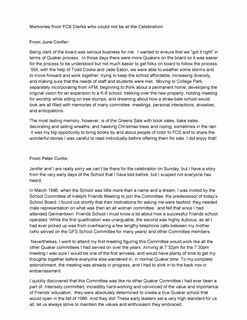 The FCS lobby has a new “Quaker Corner,” established by June Confer and Carole Hoage of the FCS Trustees' Quaker Life Committee, with the help of a grant from the Sue Thomas Turner Fund. A memorial service for Harold Confer, an important supporter and dear friend of our school, will be held on Sunday, October 19 at 1 p.m. in the Multi-Purpose Room. Harold loved visiting FCS, especially on Wednesday when he would join us for Meeting for Worship. Students and parents are invited to join us as we celebrate Harold’s life. Thank you to the more than 200 people who attended the FCS 30th anniversary Meeting for Worship and celebration in mid-October. And a big shout out to the parents, students, and Adelphi friends who contributed their time and effort to help plan and run the event. Here's to 30 more great years! On Grandfriends Day 2015, visiting Grandfriends were asked to write letters to their former selves sharing the wisdom and perspective that comes with living. Here are those letters, shared with students in the classrooms and saved for future students to enjoy and ponder. Send in your FCS photos (with a caption! ), memories, and stories by emailing Christine@friendscommunityschool.org.